Canada's top MD Program and MD/PhD Program welcomes international and US applications. The University of Toronto’s commitment to excellence in teaching and research ensures we are consistently ranked among the best universities in the world. 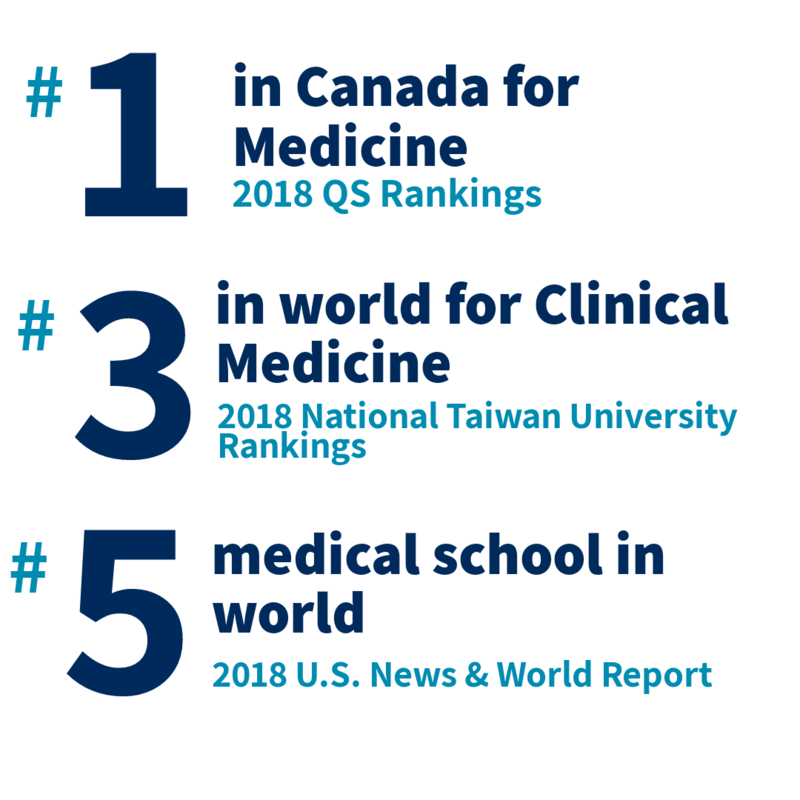 In 2018, the University of Toronto was ranked number one in Canada for Medicine in the QS Rankings. We were also ranked in the world’s top three universities for Clinical Medicine in the 2018 National Taiwan University Rankings. And in November, our Faculty of Medicine was named among the world’s top five medical schools by U.S. News & World Report. The Times Higher Education 2019 World University Rankings by Subject ranked U of T among the top ten public universities globally in education, law and clinical, pre-clinical and health. The University of Toronto ranks highest in Canada in nine different subjects, and is one of only eight universities in the world to place in the top 50 across 11 subjects, according to new rankings by the prestigious Times Higher Education. The University of Toronto was named the top Canadian university in the 2018 US News & World Report Best Global Universities Ranking, the 2019 Times Higher Education World University and University Reputation Rankings, and the Shanghai Jiaotong 2018 Academic Ranking of World Universities. Interested in applying? Watch our MD Program International Admissions Presentation (recorded March 2017) for a detailed outline of the application process, admission requirements and the amazing benefits of studying medicine at U of T. A series of video chats are available to watch on our facebook pages to help with the admissions process. You are also welcome to contact our admissions team directly with any questions. Situated in one of the most diverse urban centres in the world, our MD Program is an ideal destination for international learners. Toronto is the fourth largest city in North America.